Our discussion group in Oundle is led by Charlie Efford. Keep up to date with upcoming events on MeetUp or contact Charlie via email at charlie.efford@tiscali.co.uk or on 01832 281442 / 07798 620852. New Age, New World, New Government? Power over or Power through the People? Education – what should we really be teaching our children? God, Great Divine or All that is – What do these mean to you? We are social beings and most of us need to be part of a family and accepted into a community to thrive. In daily life we interact with our relations, friends and many others in the groups that frame our lives. At a different level we have our soul groups and they seem to offer us something more profound. Law of Attraction – real or not? There are many books about the Law of Attraction – promising us the secret to manifest whatever we want. The offer is seductive and hard to resist. In practice, bringing what we want into our lives is often harder than the books suggest! What do we have to do to make it work (if it is real)? What real life examples have you had? Victims, Persecutors & Rescuers. Why do we choose the roles we play? 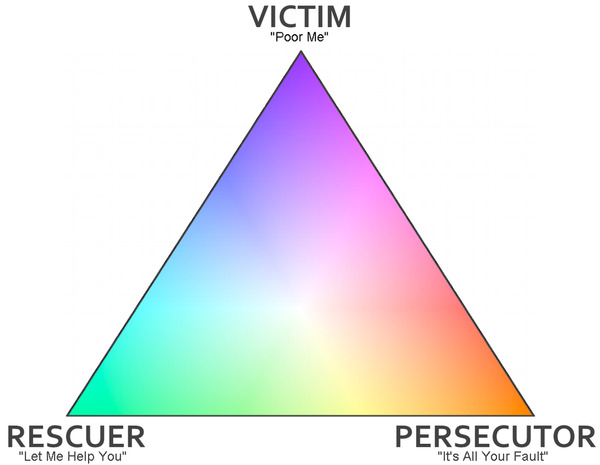 Which role do you find yourself playing most often; victim, persecutor or rescuer? Many people seem to be choosing to be victims. Does society have an impact? What does being a victim looks like in practice and what is going on for the rescuers and persecutors. I am also curious about the spiritual dimension – choosing to be happy is one aspect of our spirituality, what we are learning about people and relationships when we play these roles maybe another. How do our partnerships and special relationships help with our spiritual growth and how do we contribute to the growth of others? • What is the purpose of marriage and is divorce a bad thing? • One partner or many partners? • How important is sexuality in a relationship? Divine Plan, Fate & Free Will – how do we navigate through life? We live on the planet of free will where we can make our own life choices – or can we? How does a Divine Plan and Fate affect our ability to be truly free? Should we simply make the best choices we can or surrender to Divine will ? Souls, Personalities and Egos – Who are we? Our identity is shaped by our Mind, Body, Soul, Personality and Ego amongst others – but who are we really? Society has strong values about what makes you a good person. What do you think? What would a world with male and female energies in balance look like? Does the world need more Conscious people?